The Miss Universe Pageant concluded not long ago and my favorite contestant won the the crowd! It was no other than the one and only Miss Angola 2011 Leila Lopes! I was rooting for Miss Angola from the minute I saw her last week while I finally got into the Miss Universe mode like I always do each year. I knew she had a lot going for her because my first impression of her was "Wow! What a beauty!" and then when I researched more about her and found out about her character I was totally sold on supporting her. Not only was this woman beautiful but she was also smart, elegant and super kind-hearted. I found her official page on Facebook and a few days later she "liked" my supportive comment to her and I thought that was the sweetest thing ever. I'm extremely proud of my Angolan roots and she made me even more proud today. This post was basically to share my excitement with you all. 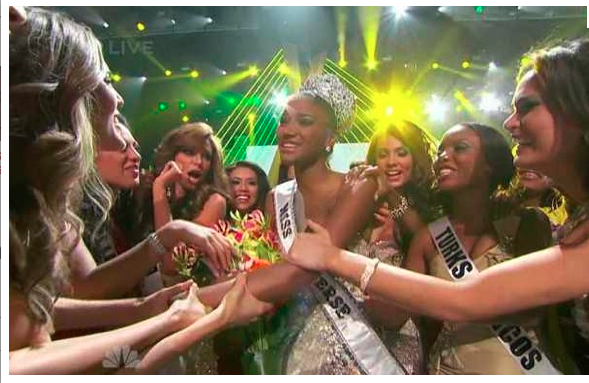 Miss Universe Leila Lopes definitely inspires me to go for the crown someday like I always dreamed of! I'm so happy she won, she is just stunning!